Sizing Tennessee gained an impressive victory over Elegant Escape as trainer Colin Tizzard recorded a memorable first and second in Britain’s second-richest handicap chase. Ridden by Tom Scudamore, the 10-year-old son of Robin Des Champs travelled menacingly into contention approaching the home straight and took the lead four fences from home. Sizing Tennessee went clear and sealed a tremendous victory with an excellent leap at the last to run out a convincing 10-length winner. Tizzard, who is based on the Somerset/Dorset border, also saddled Elegant Escape (Harry Cobden), who ran on in the closing stages to finish second, seven lengths ahead of Dingo Dollar in third (Alan King/Wayne Hutchinson), who was prominent throughout. West Approach (Adam Wedge), who came fifth, also represented Tizzard. Reflecting on his second Ladbrokes Trophy victory following on from Native River in 2016, Tizzard said: “That was a brilliant performance from Sizing Tennessee. It was fantastic to win and it’s an unreal day. “We haven’t run this horse since he bolted up at Fontwell in October. We wanted to give him one race before Christmas and he delivers that performance. Sizing Tennessee had leg trouble before he came to me and he was a horse who had low mileage. “Sizing Tennessee strode away today and obviously it does surprise you with the manner in which he won. I thought he would run a big race and he was travelling well on the way into the straight. He was the horse in the home straight that if he didn’t clobber one, he was going to win. “His jumping has become very good. This horse is in the Welsh National and that is something we might look at. “Elegant Escape ran on really well to finish second and I was watching him thinking that he wasn’t going to catch Sizing Tennessee. He has run a real solid race and he is also in the Welsh National. Joe Tizzard, an assistant trainer to his father Colin, added: “Sizing Tennessee is clearly improving. That was a serious performance today. They went an end-to-end gallop and that played to his strengths. “Sizing Tennessee stays very well and that is what he showed today. “I think he is going to be more of a Welsh National horse as he looks to be a horse who is all about stamina and that stamina showed today. An emotional Tom Scudamore, successful for the second time in the Ladbrokes Trophy after Madison Du Berlais in 2008, commented: “I lost my grandad two weeks ago, my mother’s father, and it was his funeral yesterday. but I wasn’t able to go. “Those are the sacrifices you make and I was so sorry that I wasn’t able to be there, but he was with us today. He was a tremendous man, a legend in the Ledbury area, and he helped a lot of people. It’s one is for him. “Sizing Tennessee has always been a good horse – I have said that all along and I really fancied him. I told Dave Roberts (agent) that this was the one I wanted to ride if I was given the choice. “His novice chase form from last season is very good. If you fancied Ms Parfois, you had to fancy this fellow because of how they ran at Cheltenham. We were meeting them all on better terms as well – his Fontwell run had turned out well as the second horse had come out and won twice since. “Even though he is 10, I felt that he was slightly under the radar. I didn’t expect to win quite that well but a win is a win. He didn’t quite keep galloping over four miles (when third in the National Hunt Chase at the Cheltenham Festival in March), but three and a quarter miles around here is a different ball game and I was always very happy with him. It was a great thrill. “He was a bit awkward at one or two fences but he lands running, which is all that matters. It was a really good performance and Colin is a master of these staying chasers. He has won that in the stamp of a good horse. You don’t get too many winners of this race winning that well. “It is one of the finest chases in the country and it means an awful lot. Dan Fortt won it in 1993 on Cogent and he helped me an awful lot today, even though I have ridden in the race plenty of times. From a long way out, Sizing Tennessee was going nicely and it was just up to me not to mess it up. 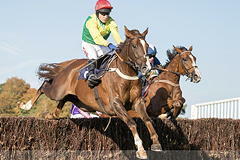 Sizing Tennessee, a second season novice, is owned by Ann & Alan Potts Limited. The Ladbrokes Trophy was first run in 1957, and it was initially staged at Cheltenham. The winner of the inaugural running, Mandarin, was owned by Peggy Hennessy, a member of the family which founded Hennessy, the race's sponsoring company. It was transferred to Newbury in 1960, and it was won by Mandarin for a second time in 1961. The race's second running was won by Taxidermist, ridden by the amateur rider John Lawrence, later Lord Oaksey, who was the breeder and part-owner of the 2011 winner, Carruthers. The Ladbrokes Trophy has been won by eight horses which have also achieved victory in the Cheltenham Gold Cup. The most recent of these is Bobs Worth, the winner of the latter race in 2013.